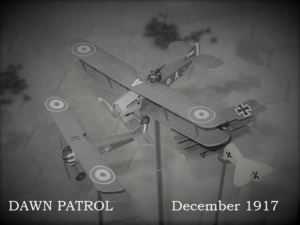 Next Tuesday, 5th December, there’s a late 1917 game of Knights of the Sky, the club WW1 aerial dogfighting multiplayer game. This will be a dawn patrol over the trenches in December 1917, with a free for all dogfight between the French, British, Belgian and German pilots. If you have a flight stand and suitable model plane (late 1917) then bring them along. If not, there will be a number available on a first come first served basis. There’s been a slight change of plan for the Bag the Hun multiplayer game on Tuesday 21st but otherwise it’s all systems go for a late war scenario, actually set on 21st November 1944. 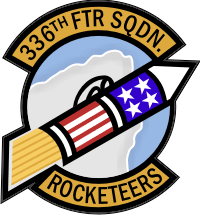 The new scenario is based on the exploits of the 336th Fighter Squadron, 4th Fighter Group, the fabulously named ‘Rocketeers’. 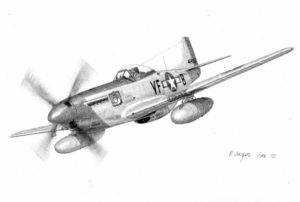 This will involve a dogfight at medium to low level in heavy over cast conditions, with the 336th in their P51-D Mustangs engaging a formation of FW-190’s and Bf109’s to the West of Merseberg in Saxony-Anhalt. 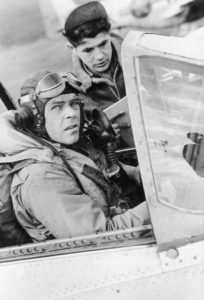 The historical action featured three kills for the 336th ‘Rocketeers’ CO Captain Fred Glover, who will make an appearance as a Junior Ace in the game. The Luftwaffe will be appearing (and disappearing) in strength, as they zoom in and out of the overcast. The scenario will make use of some lightly tweaked rules for flying in cloud cover and will inevitably involve some ‘bogeys’ to add a bit of fun!